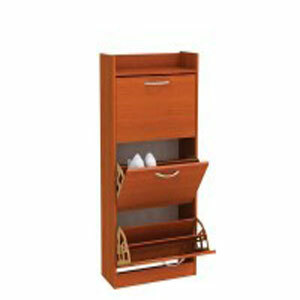 The Gulliver Shoe Cabinet Comes with 3-Drawers for you Shoes and 1-Top Shelf. Made of MDF Board with Cherry Veneer or Dark Oak Ferarra. Strong Construction. Easy to assemble. Comes in 2-Widths options. Size: W23,2 In. H49.9 In. D9,8 In. and W31,1 In. H49.9 In. D9,8 In. MA-238(ACE) W23,2 In. H49.9 In. D9,8 In. MA-241(ACE) W31.1 In. H49.9 In. D9,8 In.